It will all depend on what I can afford lol. I want to meet Christopher Eccleston if I get his Diamond pass it uses up most of my budget probably not got a chance of getting his Auto without it . 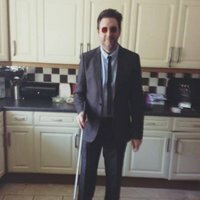 These are my maybes: Jason Isaaks, William Shatner, Shazad Latif, Charles Dance, Walter Koenig, Gina Torres, Katee Sackhoff, Alfie Allen, Jenna Coleman, Christiana Ricci, John Barrowman, Billy Dee Williams, Bernard Cribbins, Sylvester McCoy (Who I have already met so may have to miss out this time, he is great to meet if anyone has not met him and considering it) , Colin Baker, John Leeson, Peter Purves, John Levene. I would add Jason Momoa but I think he is too expensive! Getting a headache now lol. trying to figure it out and of course there will be more guests :O This is what I am currently thinking: Friday: Alfie Allen, John Barrowman, William Shatner, Jason Isaaks. Saturday: Christopher Eccleston, Jenna Coleman. Sunday: Sylverster McCoy, Colin Baker, Bernard Cribbins. I'm still not sure if I am going this year, so if you could get any of these it may make my mind up at present there is only a couple of people going this year that interest me, so here is my Wish List: Any Star Wars Actors (but especially these): Mark Hamil, Ewan McGregor, Daisy Ridley, Anthony Daniels. Any Game Of Thrones Actors (but especially these): Sean Bean, Mark Addy, Lena Headey, Emilia Clarke, Kit Harrington, Kristian Nairn, Natalie Dormer, Sophie Turner, Maisie Williams. Any Doctor Who Actors (but especially these): David Tennant, Christopher Eccleston, Matt Smith, Billie Piper, Karen Gillen, Jody Whittaker, Tom Baker, Peter Capaldi, Carol Ann Ford, William Russell, Catherine Tate, Freema Agyeman, Paul McGann, Noel Clarke. Any Marvel Netflix Actors (but especially these): Krysten Ritter, Charlie Cox, Rosario Dawson, Vincent D'Onofrio, Mike Colter, Finn Jones, Deborah Ann Woll, Eldon Henson, Elodie Yung, Jessica Henwick, Rachel Taylor, Jon Bernthal, Elizabeth Moss, Carrie Ann Moss. The Boys From the Dwarf: Chris Barrie, Craig Charles, Danny John Jules, Robert Llewellyn, Norman Lovett, Choloe Annett, Mac McDonald, Clare Grogan. X-Files - David Duchovny, Gillian Anderson, Mitch Pileggi, William B. Davis, Laurie Holden Star Trek: Patrick Stewart, Brent Spiner, Jonathan Frakes, LeVar Burton, Marina Sertis, Michael Dorn, Gates McFadden, Colm Meaney, Denise Crosby, John De Lancie, Sonequa Martin Green, Doug Jones, Jason Isaacs, Anson Mount, Avery Brooks, Rene Auberjonois, Alexander Siddig, Nanna Visitor, Armin Shimerman, Terry Farrell, Andrew Robinson, Nicole De Boer, Kate Mulgrew, Jeri Ryan, Roxann Dawson, Ethan Phillips, Robert Picardo, Tim Russ, Jolene Blalock, Scott Bakula, John Billingsley, Linda Park, Connor Trinneer. Other Randoms: Millie Bobby Brown, Natalia Dyer, Winona Ryder, Sean Astin, Alan Tudyk, Nathan Fillion, Gina Torres, Morena Baccarin, Adam Baldwin, Summer Glau, Jewel Staite, Kevin Smith, Sigourney Weaver, Katheryn Winnick, Andy Serkis, Any Big MCU stars Please :) Now I won't be able to afford all the above lol. So please don't get them all :S Thanks GAZ. I have a list of maybes I still haven't decided if I am going this year, no one has really been announced yet that makes me want to commit. Maybes are: William Shatner, Walter Koenig, Christiana Ricci, Alfie Allen, Jenna Coleman, John Barrowman. Prop or Set Photo suggestion. It's so hard to choose, but I have gone with David Bowie. 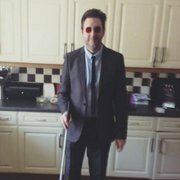 I think I am going as Matt Murdock (Daredevil) same as my picture which I did last year. I have a John Snow costume from Game Of Thrones complete with Longclaw for one day. And the last day I will be my favourite Doctor, David Tennant. Woo! Who! I got me a series 10 Steelbook with his and Pearl Mackie's name on it, well I will have I'll show myself out. Just Binged Stranger Things so : Winona Ryder, David Harbour, Millie Bobby Brown, Sean Astin, Paul Reiser, Natalia Dyer, Finn Wolfhard, Gaten Matarazzo, Noah Schnapp.